i live in new york city, so i've heard a few car horns. ok, i've heard a lot of car horns. this morning i was walking with a friend and he screamed back at a car stuck in traffic "why are you honking? what do you think is going to happen?" i laughed and said that the people honking in the cars were likely very upset about a lot of things, and that they didn't know how to express those emotions in their lives. so? they honk. "honk" is my new shorthand for "wah wah wah, i don't know how to properly process this!" we're all guilty of this occasionally, of course. what's funny about my response to the above story is that i immediately replied with compassion to the people polluting my environment with noise. but when i fail to process something well, i rarely reply with compassion toward myself. last night a friend told me that they were dealing with some depression/anxiety issues. i replied with compassion. but when i think about my own issues? i reply with the opposite. "why do i feel this way today? what's wrong with me? why can't i feel this way? why can't i act this way?" mid-blog writing, i paused for dinner. i ran home while listening to a podcast and then over to a friend's to watch a tv show while eating pizza. 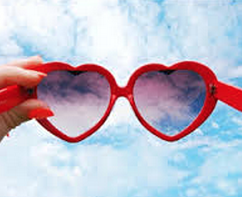 in those two instances of media mid-writing, i heard two instances referring to the saying "rose-colored glasses." i've never particularly liked that phrase, because i thought that it kind of makes fun of optimists, and i consider myself to be one most of the time. I love the metaphor of rose-colored glasses. That’s the way to view the world. They’re rose-colored, meaning there is a tint. You are seeing a rosier future than we will really experience. But they’re glasses. They’re not opaque, right? They’re not blinders. You actually are seeing the world. And if there’s a train coming, it’s a little bit rose-tinted, but it’s a train. i really really liked his interpretation of the glasses. it made me feel hopeful. and then, mid-pizza, i heard another reference to rose-colored glasses on bojack horseman. a character on the show said "when you look at the world through rose-colored glasses, all the red flags just look like flags." ...and then i felt compassion for that character. it was a potent line, but it didn't dissuade me from wanting to be optimistic about the world. perhaps cautiously optimistic, but still optimistic. and all of this rose-colored talk reminded me of the compassion i was trying to cultivate toward myself. what if i just slightly altered my perception of myself instead of something more drastic? practicing on others has given me the tools; i just have to reflect the rose-colored tint back inwards. a rose-colored mirror, if you will. self-compassion. self-love. hands on heart.